The loosely-defined field of sound art seems to be having a bit of a moment right now. Established institutions such as New York’s MOMA and Metropolitan Museum have recently had major exhibitions of audio works, while electronic music festivals such as CTM, Mutek or Unsound have endeavored in recent years to include ever more works that connect sound to sculpture, performance, video and other non-musical disciplines. In this context, Montreal-based artist Nicolas Bernier is one of the most interesting artists working today. He describes his own work as electronic music made with objects of the past and manipulated by modern means (including Live and Max for Live). But beyond the sophistication of his means, Bernier manages to elegantly balance the cerebral and the sensual, as is apparent in his piece frequencies (a) , which was recently awarded the prestigious Ars Electronica Golden Nica prize for digital musics and sound art. Congratulations on winning the Golden Nica. How did the idea of working with tuning forks for frequencies (a) come about? The idea to work with the tuning forks came up quite some time ago when I was looking for a way to integrate stable pitches into my sound performances that were mainly noise/object based. I was trying to avoid the use of more traditional musical instruments as tonal elements. As I often worked with obsolete objects, I am always thinking about the relation between music, sound, old and new technology. The use of the tuning fork made perfect sense because it was a scientific precision tool in the past, and is a symbol of tonal music, but foremost because it produces a sound that is close to the pure sinewave, the very primitive sound used in electronic music composition. I started a collection of all kinds of tuning forks, from pre-440hz 19th century to more recent medical ones. I brought my forks everywhere with me (I was doing a bit more improv at the time) and then I made a first album with them ( strings.lines , 2010, Crónica). I gradually became totally obsessed with the fork and it became my primary musical instrument in a way. But I was still unsatisfied because I couldn’t be as precise as I wanted to, by manually manipulating the forks myself. This is when the idea of automating the forks came up. What are the ideal conditions for performing frequencies (a) and what is your technical set-up like? Elektra Festival in Montreal gave me the best conditions I could possibly think of for this performance: a small venue (100 persons max.) solely dedicated to the presentation of frequencies (a) for 3 days in a row. This is a real luxury, as usually electronic music festivals are quite formatted: big room, big video screen, no time to adjust your setup according to the new environment. There is a reason for that, so this is not a critique, but the thing is that some pieces have other requirements. This is the case with frequencies (a) , as it was not built with any standard presentation format in mind but with the specific needs of the piece. 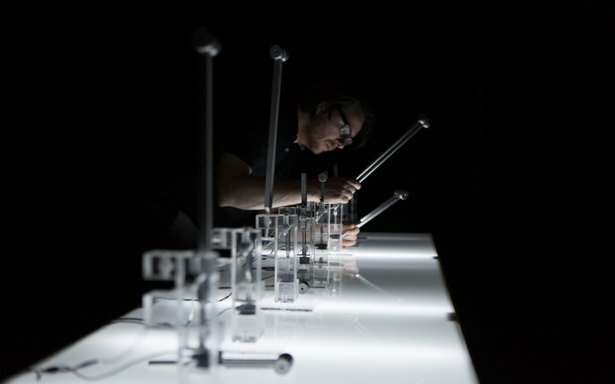 Because the piece is dealing with small objects (the tuning forks, small solenoids, gentle sounds, precision), the public needs to be close to the piece. It is built on the principle of intimacy rather than grand spectacularity. Concerning the equipment, with the help of Laurent Loison and Olivier Lefebvre, we’ve built small acrylic structures holding the tuning forks and the solenoids used to activate the forks. Each of them are linked to a contact mic and a light flux coming from the custom lighting table on which they are placed. The table is also hiding the electronics (a USB/DMX board). All the voltage sent to the lights and the solenoids are sent through this board. Then it is all a matter of composition, of organizing the audiovisual sequences in time, which I do with Ableton Live and Max For Live. How did you arrive at the mixture of electronic and mechanical elements in your work? This relationship between the electronic and the mechanical/physical was actually the trigger that made me want to work in the field of electronic arts. Today this dialogue between those elements is totally fluid, but 10 or 15 years ago, at the apotheosis of the laptop performance, that mix was extremely intriguing as most of the works were either totally digital or not. Since then my work has always relied on the use of physical elements that are processed by the computer. The trigger for an idea or a project always comes from the physical world but the way I want to present this idea always needs computing capabilities. But most important for me is the balance between the elements, trying not to fall into creating either a completely “natural” or completely “digital” work. I actually think there is no distinction between the natural or the virtual/artificial. Everything is connected and communicating together, everything is processed in a way or another. The Ars Electronica prize that you were awarded is in the category Digital Musics and Sound Art. Do you think of yourself primarily as a musician? I am profoundly interested by the arts and I am not sure I understand why there are some “categories”, if not primarily for political and historical reasons. Nevertheless, I can’t argue with this: my main medium is sound and will most probably always stay sound. But my interest lies everywhere, giving a multiplicity of influences to my work. When I am touched by something, I am not asking myself the question about what category the thing fits in. It is the same thing when I create; I just do what I need to do, not asking myself if it fits this or this category. This is why even if my medium is sound, I am often asking myself questions about the performative, the theatrical, the gestural, the visual and, of course, the musical. How does your new piece entitled frequencies (synthetic variations) relate to frequencies (a) ? And what else do you have planned in the near future? frequencies is actually a series of works around the pure/impure dichotomy, split into 3 parts: acoustic, digital and electronic. I am, in a way, visiting the three main historical evolution stages of the tone. The (a) in the first part stands for “audio” or “acoustic” because the tuning forks are producing an almost pure acoustic tone. The second instalment presented at Mutek ( synthetic variations ) is entirely based on digital sounds. In this performance I am using the same system used in frequencies (a) except that there is nothing acoustic, no tuning forks, no solenoids and no human performance per se. It’s my first laptop performance in a way, but visually translated into physical elements. It consists of pre-written sequences of synthetic sounds with light synchronised within synthetic material, the small acrylic structures. I will keep the secret of the third part for now. Nicolas Bernier’s Frequencies (Synthetic Variations) is out now. Go to Nicolas Bernier’s website to see and hear more of his works.